While we are still enjoying the sights and sounds of summer days, it is high time to think about preparing our homes for the hotter months. From rustic style to exotic prints, be sure that you have everything you need for the hottest period of the year. For example, an apartment should feel light, airy and refreshing. You don’t have to change the whole interior. You can just add some cheerful details, beautiful and soothing colors that would eventually make a huge difference. Designers offer a variety of styles: from rustic to urban, aiming to create an elegant environment that involves the three elements – proportionality, functionality and beauty. The first thing that should be present in the summer interior is a light. It is a generally known fact that light colors make a room look bigger and brighter. Light and bright walls are more reflective, which helps maximize the effect created by natural light. If you do not want to radically change the interior, you can focus on the blankets, rugs, bedspreads with warm tones and wall panels with geometric patterns. Be sure that all of this will add the uniqueness to your home. In addition, fresh flowers and vibrant paintings on the wall will make your room look gorgeous. Eco-friendly materials like bamboo and hemp will add natural feeling of the outdoors in. You can spice up the interior with typical summer decorations such as butterflies, ladybugs, or flowering plants. The interior, which is based on green color, creates a feeling of freshness and coolness on a hot day. A good addition to it will be white furniture and a few orange and yellow decorations. Using such juicy colors as red, orange and yellow, you can create a truly solar interior. If your life needs more bright colors and positive mood, that's what you need. Nautical home design is something that will never go out of style. With a few details you can easily create the feeling that the ocean is never far away. This beach-inspired interior is characterized by the combination of white with blue, light blue or turquoise. Don't forget to use attractive decorative elements such as starfish, stripes, anchors and nautical stars. When you want to keep out the hot summer sun use curtains instead of drapery. Drapery material is heavy and dark, while curtains can give your home a fresh look. 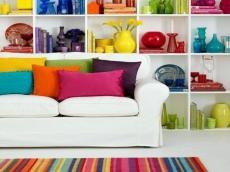 Go ahead and bring out the lively colors that will bring freshness into your home!